We study animal behaviour for several reasons; because we are curious about the species with which we share the planet, because it can give insights into our own behaviour and because it has applied relevance in conservation, animal production and animal welfare. This unit deals with several key areas of animal behaviour. We investigate animal communication systems, with particular emphasis on how signals are produced, transmitted and received, their information content and how they are sometimes used in social manipulation. We then go on to explore the way in which behaviour develops during the animal's early life and the various influences that shape this development before moving on to examine the genetic regulation of behaviour, how behaviour evolves and how we can use comparative methods to study this process. The rest of the unit is then devoted to behavioural ecology which deals with the role of behaviour in the animal's interactions with its environment and the ways in which the environment shapes adaptive behaviour on an evolutionary time scale. Topics covered in this area include foraging and anti-predator behaviour, social organisation, mating systems and parental care. Practical work comprises small research projects carried out in groups over several weeks. You will learn how to design, carry out, analyse, talk about and write up such a project. The variety of animals studied includes insects, fish, frogs, and birds. 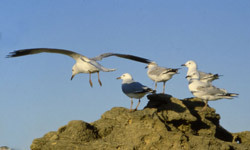 The types of behaviour studied may include foraging, space use, aggression, communication and many others. Communicate findings to a scientific and a general audience in individual and group settings.